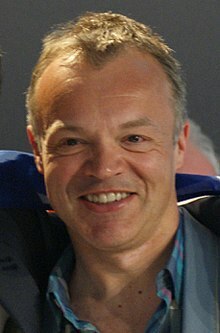 Graham William Walker (born 4 April 1963), known professionally as Graham Norton, is an Irish television and radio presenter, comedian, actor, and author based in the United Kingdom. He is a five-time BAFTA TV Award winner for his comedy chat show The Graham Norton Show and an eight-time award winner, overall. Originally shown on BBC Two before moving to other slots on BBC One, it succeeded Friday Night with Jonathan Ross in BBC One's prestigious late-Friday-evening slot in 2010. Norton was born in Clondalkin, a suburb of Dublin, and grew up in Bandon, County Cork. His family are members of the Church of Ireland. His father's family were from County Wicklow, while his mother was Northern Irish, from Belfast. Norton took part in the TV programme Who Do You Think You Are? to trace his ancestry. His father's direct ancestors originated in Yorkshire. Norton was educated at Bandon Grammar School, in West Cork, and then University College, Cork, where he spent two years studying English and French in the 1980s but did not complete his studies. In June 2013, he received an honorary doctorate from University College Cork. Norton moved to London and attended the Central School of Speech and Drama. He also worked as a waiter during that time. Upon joining the actor's union Equity, he chose Norton (his great-grandmother's maiden name) as his stage name, as there was already an actor called Graham Walker. In 1992, Norton's stand-up comedy drag act as a tea-towel clad Mother Teresa of Calcutta in the Edinburgh Festival Fringe made the press when Scottish Television's religious affairs department mistakenly thought he represented the real Mother Teresa. His first appearances in broadcasting were in the UK, where he had a spot as a regular comedian and panellist on the BBC Radio 4 show Loose Ends in the early 1990s, when the show ran on Saturday mornings. His rise to fame began as one of the early successes of Channel 5, when he won an award for his performance as the stand-in host of a late-night TV talk show usually presented by Jack Docherty. This was followed by a comic quiz show on Channel 5 called Bring Me the Head of Light Entertainment, which was not well received as a programme, but did enhance Norton's reputation as a comic and host. In 1996, he co-hosted the late-night quiz show Carnal Knowledge on ITV with Maria McErlane. Also in 2003, Norton was listed in The Observer as one of the 1000 funniest acts in British comedy. (Though Norton is Irish, the bulk of his television career has been in the UK.) In January 2004, he was named the most powerful person in TV comedy by Radio Times. In the summer of 2004, Norton ventured into American television. 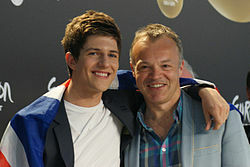 The Graham Norton Effect debuted on 24 June 2004 on Comedy Central, and was also broadcast in the UK on BBC Three. In the midst of controversy surrounding Justin Timberlake and Janet Jackson's Super Bowl performance, Norton was wary of moving into the market. In October 2018, talking to BBC News about his reported 2017-18 BBC salary, Norton said that he genuinely "doesn't know" how the corporation arrived at that figure. "Myself and my agent look at that number and we go 'I wonder how they came up with that'," he says. "It bears no relation to anything I know. But if that's what they say I earn, that's what I earn." In February 2019, it was announced that Norton will be a judge on RuPaul's Drag Race UK alongside Alan Carr in a rotating basis. Norton and Carr will be joined by permanent judges Michelle Visage and RuPaul. Norton presents a Saturday morning show on BBC Radio 2, featuring guest interviews and music. It also features an "agony aunt" section with advice from Maria McErlane and Norton, called "Grill Graham". "Tune with a Tale" is where a listener suggests playing a song with a plot, summarising the story it contains, and "I Can't Believe It's Not Better" is a feature where a listener requests a song that was previously a hit, but might be considered particularly bad now. In October 2008, it was confirmed by the BBC that Norton would replace Terry Wogan as the presenter of the UK heats of the Eurovision Song Contest, Your Country Needs You. 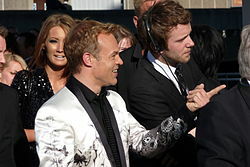 On 5 December 2008, it was announced that Norton would also take over from Wogan as the presenter of the main Eurovision Song Contest. The 54th Eurovision Song Contest was held in the Olympic Stadium, Moscow on 16 May 2009. In 2015, Norton, along with Petra Mede, hosted the Eurovision's Greatest Hits concert show on 31 March at the Eventim Apollo, in Hammersmith, London to commemorate the Contest's 60th anniversary. In 2007, Norton featured in Girls Aloud and Sugababes' Comic Relief video for the single "Walk This Way"
In January 2009, Norton made his West End stage debut in a revival of La Cage Aux Folles at the Playhouse Theatre. In 2009, Norton was the host of the comedy game-show Most Popular on US cable television channel WE tv. Norton currently[when?] writes an advice column in The Daily Telegraph newspaper. In October 2010, these columns were made into a book entitled Ask Graham, published by John Blake Publishing. In 2016, Norton published his debut novel Holding, published by Hodder & Stoughton, about a murder in an Irish rural community. Norton won Popular Fiction Book of the Year award for Holding in the Bord Gais Energy Irish Book Awards 2016. On 7 March 2013, Norton broke the Guinness World Record for "Most Questions Asked on a TV Chat Show" on Comic Relief's Big Chat, which raised £1.02 million. In 2014, Norton criticised the decision by Irish broadcaster RTÉ to settle out of court with opponents of gay marriage who claimed they had been defamed in an edition of the Saturday Night Show. In 2014, Norton publicly backed "Hacked Off" and its campaign toward UK press self-regulation by "safeguarding the press from political interference while also giving vital protection to the vulnerable". In October 2014, Norton released his second memoir, The Life and Loves of a He-Devil. It won in the Non-Fiction Book of the Year category at the 2014 Irish Book Awards. Also in 2014, he was named in the top 10 on the World Pride Power list. Norton has a shareholding of two percent in New Zealand winery Invivo Wines. Norton has his own wine range in collaboration with Invivo, the first wine was first released in 2014. In July 2015, the Bishop of Cork, Dr. Paul Colton, hosted an evening with Norton involving 90 minutes of interview, questions, and answers with an audience of more than 400 people. The event, part of the West Cork Literary Festival, was sold out. In 1989, Norton was mugged, beaten, and stabbed by a group of attackers on a street in London. He lost half of his blood and nearly died. Norton said that an elderly couple were the ones who found him, and said they "saved his life" after calling for an ambulance. Norton said he did not think the attack was homophobic, as he was by himself at the time. He was hospitalised for two-and-a-half weeks before eventually recovering from the attack. Norton resides in London. He owns a holiday home in Ahakista, County Cork and an apartment in New York City. Norton has two dogs, a labradoodle called Bailey and a terrier called Madge, which he adopted from the UK charity Dogs Trust. In January 2012, Norton's East London home was burgled. The keys to his Lexus were stolen during the burglary. He appealed for the return of his car during his BBC Radio 2 show the following day. Norton is openly gay. He split up from his partner of two years, Trevor Patterson, in 2013, and broke up with his subsequent partner, Andrew Smith, in 2015. Norton said in 2015 that his ex-boyfriends often resented the role they had to play in the public eye as his partner. Norton, Graham (2004). So Me. London: Hodder & Stoughton. ISBN 978-0-340-83348-3. OCLC 57577106. Norton, Graham (2014). The Life and Loves of a He Devil. illustrated by Clym Evernden. London: Hodder & Stoughton. ISBN 978-1-444-79026-9. OCLC 894427373. Norton, Graham (2010). Ask Graham: He's Been Everywhere, He's Seen Everything. Now Graham Norton's Here to Solve Your Problems!. London: John Blake. ISBN 978-1-843-58501-5. OCLC 847858351. Norton, Graham (2016). Holding. London, England: Hodder & Stoughton. ISBN 9781444792003. OCLC 960416528. ^ "BBC pay". BBC News. 11 July 2018. Retrieved 8 September 2018. ^ Norton, Graham. So Me. Hodder & Stoughton. p. 4. ISBN 0-340-83348-3. ^ a b "Graham Norton sells production company So TV to ITV". BBC News. Archived from the original on 4 November 2012. Retrieved 18 October 2012. ^ Bootboy. "Reasons to be cheerful". Hot Press. Archived from the original on 19 February 2010. Retrieved 20 June 2007. ^ a b c "Graham Norton" Archived 27 July 2010 at the Wayback Machine. Who Do You Think You Are? ^ "That's Dr Norton to you – comic gets honorary degree". Irish Independent. Retrieved 11 June 2013. ^ a b Jones, Liz (3 September 2004). "Graham's growing pains". London Evening Standard. Archived from the original on 2 October 2012. Retrieved 28 November 2011. ^ Turpin, Adrian. "Festival Eye". The Independent. p. 24. ^ "Graham Norton: Naughty but nice". BBC News. Archived from the original on 6 September 2017. Retrieved 4 December 2011. ^ Robinson, James. "Summer stand-ins steal the limelight". The Observer. Archived from the original on 27 December 2013. Retrieved 4 December 2011. ^ Rainey, Sarah (10 May 2013). "Graham Norton: the making of a national treasure". ISSN 0307-1235. Archived from the original on 19 October 2017. Retrieved 13 October 2017. ^ a b Cohen, Benjamin (27 April 2006). "Graham Norton: "I’m too old to be attractive to gay men" Archived 24 October 2011 at the Wayback Machine. Pink News. Retrieved 14 June 2011. ^ "Norton tops comedy list". London Evening Standard. London. 12 January 2004. Archived from the original on 13 September 2017. Retrieved 13 September 2017. ^ Norton, Graham. So Me. Hodder & Stoughton. pp. 326–333. ISBN 0-340-83348-3. ^ "Graham Norton: My career could've gone a very different way". BBC News. Retrieved 13 October 2018. ^ "Norton's radio hunt for his stolen car". Raidió Teilifís Éireann. 10 January 2012. Retrieved 1 August 2015. ^ "Eurovision: Norton to replace Wogan". BBC Press Release. BBC. Archived from the original on 8 December 2008. Retrieved 16 May 2009. ^ "Graham Norton to star in La Cage Aux Folles". 27 November 2008. ISSN 0307-1235. Retrieved 9 November 2018. ^ "Most Popular Bio: Graham Norton – WE tv". Wetv.com. 20 July 2012. Archived from the original on 11 February 2011. Retrieved 4 July 2014. ^ "Holding by Graham Norton review – a solid debut". The Guardian. 2 October 2016. Archived from the original on 11 October 2016. Retrieved 11 October 2016. ^ "Graham Norton and Paul O'Connell among prize winners at Irish Book Awards". 17 November 2016. Archived from the original on 21 November 2016. Retrieved 20 November 2016. ^ "Graham Norton breaks world record and raises £1 million with Big Chat – TV News". Digital Spy. Archived from the original on 10 March 2013. Retrieved 11 March 2013. ^ "Graham Norton 'furious' over RTE homophobia payout". BBC News. 21 February 2014. Archived from the original on 21 February 2014. ^ "Benedict Cumberbatch, Alfonso Cuaron, Maggie Smith Back U.K. Press Regulation". The Hollywood Reporter. 18 March 2014. Archived from the original on 7 June 2014. Retrieved 4 July 2014. ^ Burrell, Ian (18 March 2014). "Campaign group Hacked Off urge newspaper industry to back the Royal Charter on press freedom – Press – Media". The Independent. Archived from the original on 14 July 2014. Retrieved 4 July 2014. 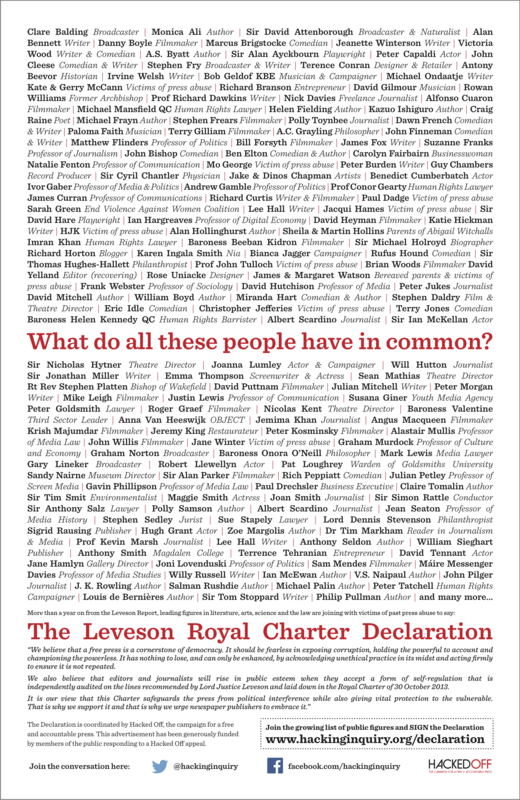 ^ "The Leveson Royal Charter Declaration". Hacked Off. Archived from the original on 2 March 2015. ^ "The Life and Loves of a He Devil". Irish Book Awards. 14 December 2014. Archived from the original on 19 December 2014. Retrieved 19 December 2014. ^ Anthony, John (10 April 2016). "Graham Norton giving Invivo Wines celebrity factor". The Dominion Post. Wellington. ^ "Norton's Kiwi wine a star seller". The New Zealand Herald. 7 September 2014. ^ "Bishop Paul Colton Hosts an Evening with Graham Norton at West Cork Literary Festival". Ireland.anglican.org. 20 July 2015. Archived from the original on 19 April 2016. Retrieved 7 April 2016. ^ Norton, Graham (2 October 2010). "Graham Norton: agony uncle". The Daily Telegraph. Archived from the original on 24 June 2011. Retrieved 28 November 2011. ^ "Graham Norton reveals he was stabbed and left for dead in horrific attack". evoke.ie. 16 June 2018. Retrieved 14 October 2018. ^ Gerard Gilbert (19 October 2012). "Graham Norton: 'I had ambition at 40. That seems to have gone'". The Independent. Archived from the original on 24 February 2017. ^ Barrett, David (7 January 2012). "TV presenter Graham Norton triggers hunt after home burgled". The Daily Telegraph. Retrieved 14 October 2018. ^ a b Wyatt, Daisy (4 January 2015). "Graham Norton: 'It's harder to find love if you are a gay man'". The Independent. Retrieved 16 October 2018. ^ "Graham Norton deleted Tinder because he kept meeting 'broken people'". Pink News. 20 September 2018. Retrieved 16 October 2018. ^ "BBC drama triumphs at RTS programme awards". The Guardian. 21 March 2001. Archived from the original on 13 April 2016. ^ "TV BAFTA winners: Graham Norton and Stephen Rea win coveted awards". Irish Independent. 10 May 2015. ^ "Graham Norton wins Special Recognition prize at National Television Awards". Radio Times. 25 January 2017. Archived from the original on 2 February 2017. ^ "Virgin TV British Academy Television Awards Winners in 2018". www.bafta.org. Retrieved 30 September 2018.